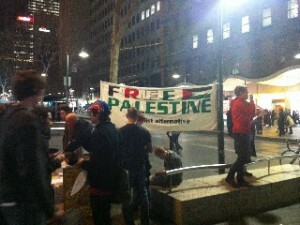 Anti-Israel demonstrators were much quieter in Melbourne on Friday night than at the violent July protest that resulted in the arrest of 19 people. The calls for boycotts of the Max Brenner chocolate chain store was restrained compared with the earlier protest where many demonstrators were charged with trespassing and assaulting police. Protest organiser Vashti Kenway said it was important for people to be aware of the alliance the retail chain had with the Israeli military. “This protest is part of an international campaign to encourage companies to divest from Israel and from their support for the Israeli military,” she said. When asked whether owners of the Max Brenner franchise Max Fichtman and Oded Brenner had made comment on the protest, Ms Kenway said they had denied their involvement with the group. “Oded Brenner has said he doesn’t understand the issues and he’s a man of peace, but we reject that as the company that owns Max Brenner – the Strauss group – has a statement on its website actually declaring their long standing support and their ongoing committment to funding the Israeli military,” Ms Kenway said. But Friday’s gathering was only a preamble to a planned larger protest at Trades Hall this Friday, with speakers to include former Greens politician Sylvia Hale. Equating anti-Israeli feeling with anti-semitism. Excusing Israeli mistreatment of Palestinians because of the Holocaust.